#HYC - Howth Yacht Club's Sailing Committee has secured the Irish Sailing Association's Sailfleet J80 keelboats for Howth for the entirety of the 2013 sailing season, according to the club's website. The eight boats in the J80 fleet will available to club members throughout the year and will be used for keelboat club racing and for open events as a one-design class including the Volvo Dun Laoghaire Regatta, the Lambay Race and the Autumn League. The fleet will also be incorporated within the club's Adult Sail Training programme and used to introduce young sailors to keelboat sailing. Other events to feature the J80s will be the 2013 ISA National Senior Helmsmans Championships, the HYC Helmsmans Championships and the HYC Family Championships. Details regarding the schedule and arrangements for members to borrow the J80s will be posted early in the new year. In addition, there are opportunities for corporate sponsorship of each of the boats for the year. Interested parties are asked to contact the Honorary Sailing Secretary. Meanwhile, Howth YC has also posted its full timetable for next year's summer courses. #MARINE WILDLIFE - The Irish Whale and Dolphin Group (IWDG) has announced another series of its popular whale watching courses on Cape Clear in West Cork this summer. The courses cater for adults keen to learn more about whales and dolphins in Irish waters and how to observe, record and identify them. They will feature a mixture of workshops and field trips, including cliff and boat-based whale watches. Three weekend courses will take place on 25-27 May, 20-22 July and 7-9 September, led by IWDG sightings co-ordinator Pádraig Whooley. All are open to IWDG members and non-members alike, but places are limited to 20 places each weekend on a first-come-first-served basis. Admission is €70 for IWDG members (€90 for non-members), with a non-refundable deposit of €25 required. Please note that this fee does not cover transport to Cape Clear, food or accomodation (which is limited in high summer) or any boat trips. As the itinerary will be weather-dependant, some flexibility will be required. More information on the weekends and booking details are available at the IWDG website HERE. In other IWDG news, the group has secured another grant from the Island Foundation to continue its humpback whale research in Cape Verde this spring and summer. A shore-based team will be stationed in Boa Vista in an area that is "possibly the most important site for breeding humbacks in the entire northeast Atlantic". Have you found that your cruising is being restricted by your lack of knowledge and confidence? Would you like to go a longer cruise next year or to feel more confident and relaxed when you are supposed to be on your holidays? Are you tired of just crewing, want to be able to skipper the boat, but never get a look-in because the skipper always does the navigation? Would you like to charter a boat in Ireland, or even in the sun, but don’t have any of the certificates that charter companies demand? Have you always wanted to go sailing on a yacht and didn’t know how to get involved? If you answer yes to any of these questions, you should consider brushing up your skills with one of the ISA’s training courses aimed at cruising sailors. The ISA’s National Cruising Scheme has been developed over many years to assist sailors in learning and developing their skills from absolute beginner to those required to skipper a yacht on ocean passages. 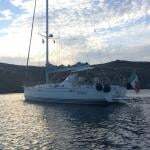 The courses are offered in either sailing or motor yachts according to what you think you will be sailing on, and are run right around the country all year around. This article aims to identify the courses and certificates that are available and to help you choose a course that will make your cruising more fun and enjoyable, wherever you are doing it and on whatever you are doing it. Courses are run on sailing yachts and on motor yachts. There are a number of 'sea-based' training courses in the scheme. These are all run at sea, aboard cruising yachts. On the lower level course such as Competent Crew, you will learn how to sail or handle the boat under sail and engine as well as simply getting to grips with living aboard a cruising yacht. On the more advanced courses, you will act as skipper and navigator for the boat while on passage and when entering and leaving harbours, marinas and anchorages. Of course, all this is done under the watchful eye and guidance of your instructor. You will be amazed at how fast you pick up the skills and find out how easy all those daunting passage plans and calculations really are. The shore-based training courses in the Cruising Scheme compliment the sea-based training by allowing participants to learn and develop skills in the relative comfort of a classroom and by allowing time to absorb and practice the course material away from a boat and all its distractions. On the three shorebased courses, sailors will learn how to plan and implement passages, working up from short coastal hops on the Yachtmaster Coastal Course to extended ocean passages on the Yachtmaster Ocean Course. It covers course plotting, tide calculation, developing passage plans and identifying where you are, as well as the principles of safety. Many of these courses are run over the winter months, often as an evening class. Those successfully completing the Competent Crew, Helmsman Certificate and Day Skipper Courses all receive their certificate of competency at the end of the course. If you want one of the ISA’s Yachtmaster Coastal, Offshore or Ocean certificates, you need to apply to the ISA to be assessed by one of the ISA’s Yachtmaster Examiners. The Coastal and Offshore assessments can usually be arranged on your own boat, if you have one, otherwise the ISA will slot you in on an assessment with a boat owner. The assessments vary in duration according to the level and number of candidates on board and are an opportunity for you to demonstrate to the examiner that you can manoeuvre, pilot and take charge of a yacht at the level required. The examiners have all been trained by the ISA and, as sailors themselves, know that you go boating for fun so while being professional and thorough, your examiner will do his or her best to ensure that you enjoy the assessment. The ISA’s Yachtmaster certificates are recognised and approved by the Department of Transport. The ISA Competent Crew course provides the beginner with an introduction to the world of sail cruising. As well as learning to sail your boat, you will get to grips with living aboard a cruising boat and by the end of the course you will be able to take your place as a competent, safe member of crew aboard a sailing yacht. No previous experience or knowledge of sailing is required for this five-day training course, which may be run together or split up over weekends. The ISA Helmsman’s provides the basic boat handling and seamanship skills necessary to safely and effectively handle and manoeuvre your motor yacht both at sea and within harbours and marinas. No previous experience or knowledge of boating is required for this course which may be completed in as little as two days. The ISA Day Skipper course is a sea-based training course provides participants with the basic skills and knowledge necessary to skipper a sailing yacht by day in waters with which they are familiar or, in other words, local day trips from your home harbour or moorings. It’s a five-day course which may be broken up over weekends. Participants should have some boating experience, equivalent to the skills and knowledge covered in the Competent Crew course if you are sailing and Helmsman’s Certificate if you are using a motor yacht. During the course you will be developing your boat handling skills as well as starting to get to grips with basic weather, navigation and pilotage. Holders of the ISA Yachtmaster Coastal certificate have proven their ability to skipper a sailing or motor yacht on coastal passages during daylight and at night. In order to do so, you will be comfortably devising passage plans, calculating tides for primary ports, plotting a course to steer and estimated positions as well as filling the role of skipper and crew when taking your boat into (and out of) a wide range of conditions and situations. There three elements to the certificate. The shore-based training course (45 hours), the sea-based training course (five days) and then the assessment. You may complete any one of these on their own. Holders of the ISA Yachtmaster Offshore certificate have shown that they can skipper a sailing or motor yacht on coastal and offshore passages and crossings by day and night. In doing so, you will need to complete tidal calculations for secondary ports, offshore passage planning and boat stability. There two elements to the certificate. The shore-based training course (45 hours) and then the assessment. You may complete any one of these on their own. The ISA Yachtmaster Ocean Certificates shows that a sailor can skipper a sail or motor yacht on ocean passages without the use of electronic aids, where they are out of sight of land for extended periods. This will include the use of a sextant for position fixing, offshore communications, world weather and great circle routes. There two elements to the certificate. The shore-based training course (45 hours) and then the assessment. You may complete any one of these on their own. A five-day sea-based training course will cost between €650 and €840. This will include your accommodation (on-board) and food. Extras usually only include meals and drinks consumed ashore. Shore-based training courses cost between €400 and €600. This includes all of your course materials. A Yachtmaster assessment with the ISA will cost between €155 and €310, depending on whether it is for coastal, offshore or ocean and whether you are willing to be assessed alongside other candidates. When I received an ISA Yachtmaster navigation course as a Christmas present from my wife, I was a little apprehensive to say the least. After all, it was ten years since we sold our yacht which we sailed extensively in the Clyde and around the Scottish Islands. I always wanted to study the rudiments of navigation but got by mostly keeping land in sight except for a few occasions in fog when I had wished I knew more to ensure the safety of my crew. As the course material began to arrive in my inbox, I began to think that I had taken on more than I had bargained for. I was signed up to the very intensive eight-day course, with material which is normally set out over a more relaxed 22 week at 2½ hours per night. The first day at the Royal Irish Yacht Club in Dun Laoghaire, 15 enthusiastic ‘would-be navigators’ introduced themselves to the tutor, John Leahy. He said he would explain the reasoning but it was down to us to take it in and do the homework. The feeling of being in the trenches created an ‘esprit de corps’ and ensured they were no laggards over the eight weeks. John was good to arrange additional classes to ensure we all got across the line and we enjoyed a well deserved celebratory dinner in the club with our partners/spouses to commemorate our achievement. I’m glad I did it! I found the course intensity ideal for keeping up the momentum of interest in learning which was greatly enhanced by the teaching style of John Leahy. John's style suited the various levels of experience of the students in the class and by arranging the students to working together in small groups and assisting each other with the course work exercises. The students were not only varied in experience but also in age and gender and the competition and friendly banter made the course that much more enjoyable. Overall, a great learning experience. Jane and I completed the ISA Competent Crew course with Richard and Eady McGoveren at Malahide Sail Training on their Hallberg-Rassy 34. The course ran over two weekends earlier this July. We attended the Lombard On the Water Boat Show in Malahide in April, where Malahide Sail Training had a stand. Having booked the dates, the only variable that was a cause of concern was the Easterly wind that were forecast on the first weekend of the course. Both weekends turned out well with 15–20 knots winds and only a little rain. While we covered the various comptencies over the two weekends it never felt like work. We learned a lot of sailing theory and how to begin to put it into practice. We enjoyed several days of good sailing, a particular highlight was sailing across Dublin Bay to Dalkey on a beam reach with 15 knots breeze, both of us taking turns on the tiller. We are already planning to do our Day Skipper certificate with Richard and Eady when we have gained more experience crewing. After recovering from a serious operation on his back, which almost left him paralyzed, my dad Tony said he wanted to take up an active sport, something he had never tried before. 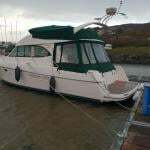 So for his 60th birthday in 2007 I decided to buy him some sailing lessons, logged onto www.sailing.ie and found details for South East Cruising School run by Charlie Kavanagh. We boarded the Saltee Dog in Wicklow town for six days (three weekends) sailing up and down the east coast of Ireland. Our main aim was to get an introduction to sailing but it soon became much more than that. In our first few hours at sea we were tacking our way up the east coast, past Bray, Killiney and Dalkey, across Dublin Bay and on our way to Howth Marina. My dad finished the course with a Competent Crew Cert while I went on to receive the ICC certification. Completing this course with Charlie gave us the passion and confidence to take newfound love of the sport to the next level. In August last year, we made the decision to purchase our own boat Shamrogue. We are now full members of Arklow Sailing Club and just this summer we competed in the Kilmichael Challenge and won our first race on board Shamrogue. This should prove to everyone that, even at 60 years of age, it’s never too late to take up sailing. Just book yourself on a course and get out there! I did the ISA Day Skipper course along with a group of friends with Oceanmaster Sail Training on board their Rival 41. We all really enjoyed it. It helps when you are staying on a beautiful yacht and eating excellent meals for the five days. We sailed around Dublin Bay (Dun Laoghaire, Dalkey Island, Ringsend, and Howth) for the week and were amazed at how we felt like tourists in our hometown because we were seeing it from a completely different perspective. It felt like a holiday. John makes his courses very enjoyable and also worthwhile – he does take his teaching seriously, so you can't switch off your brain for any length of time, even while having your sandwich at lunchtime. He has a way of explaining sailing theory that is second to none and he even managed to enlighten us regarding the dark art of navigation. I can thoroughly recommend the course, having since skippered a yacht on a number of occasions without any (major) mishaps, including one on a trip in Australia.